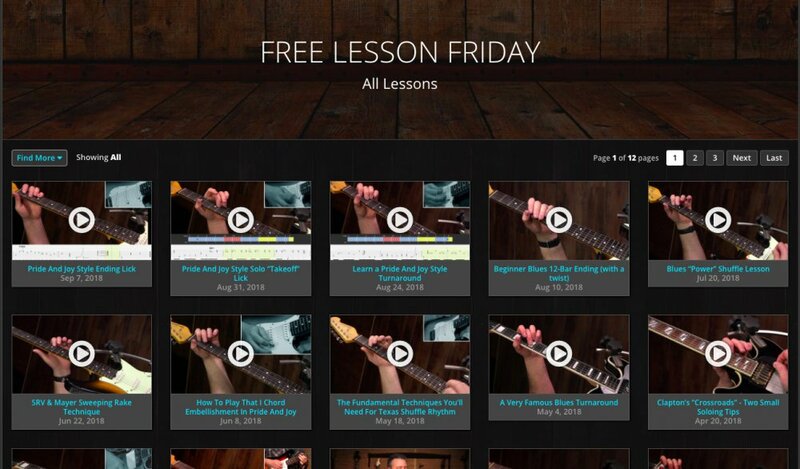 Several weeks ago I published a major update to how Free Lesson Friday videos were organized. Here's an overview of how the new features work. The first big change is the main Free Lesson Friday overview page. The first thing you'll see at the top of that page is a short list of the most recent free lessons. Beside that you'll see two tabs labeled "Artists" and "Difficulty". Inside each tab are links to all lessons on particular artists or difficulty level. After that, the rest of the page isa list of different collections of lessons, separated into different sections. The first section is called "Learn Blues Licks". In this section you'll see links to different collections lessons teaching blues licks in various difficulty levels. 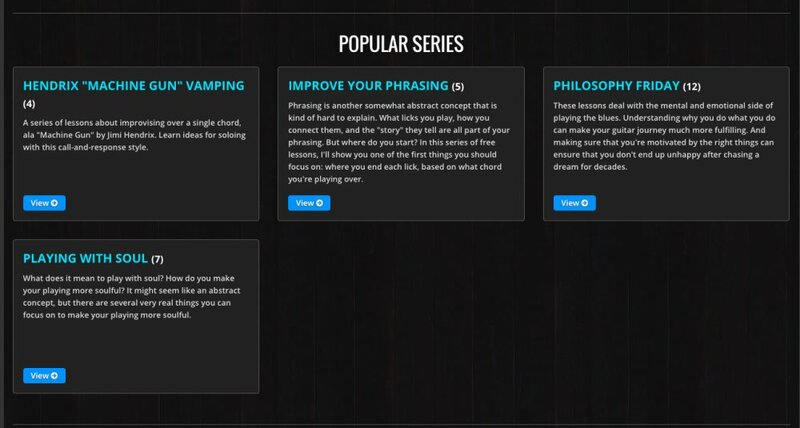 The next section is called "Topics" and here you'll see links to collections of lessons about popular topics for blues guitar. Occasionally I'll do a series of free lessons all about the same topic. In the next section you'll see links to these different series. Lastly, you'll see a section called "Technique" with links to several different collections of lessons about various blues guitar techniques. If you want to browse through all lessons by date, just click the "All Lessons" button near the top, right under the list of most recent lessons. That button will take you a page with all the lessons listed by date. At the top of this page, you'll see a button labeled "Find More". Clicking on that button will open a dropdown with several sections. Click on any section to see any collections in that section. Click on any collection and the list of lessons will be filtered to that specific collection. When you're looking at any specific lesson page, you'll see two buttons at the top. The first button is labeled "All". Clicking on that button will take you back to the list of all lessons. Clicking on the second button, "Find More", will open the same dropdown list from from the previous image. 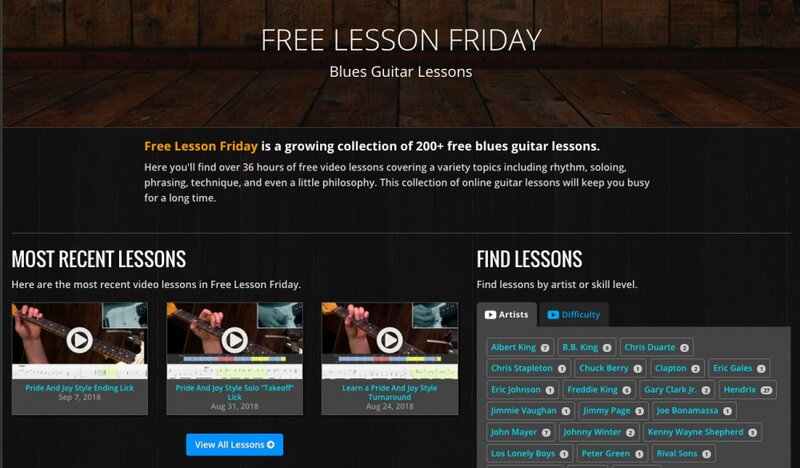 So from any lesson page, you can quickly browse to any collection of free lessons. I hope these changes make it easier to find lessons you want to watch faster. Take a few minutes and explore the changes, you might just uncover a great lesson from the past 10 years that you missed.